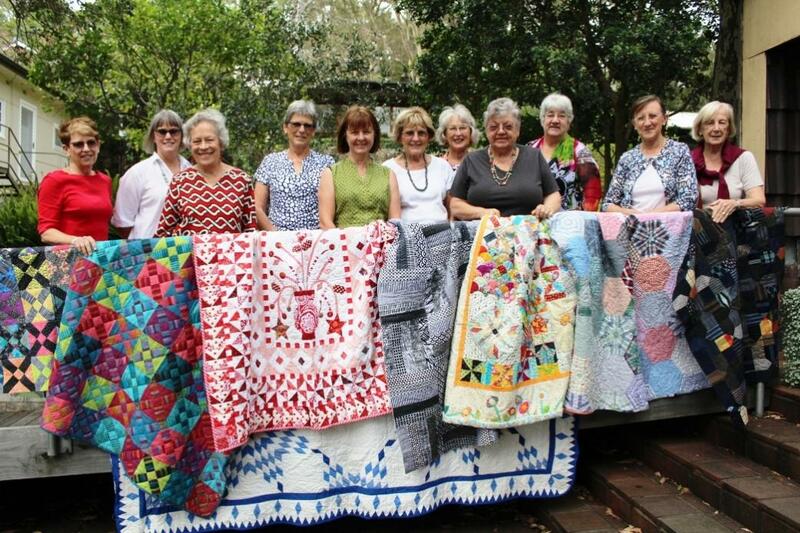 Avalon Quilters members with their raffle quilt (Queen size) - “Touching Stars”. Friday 9th and Saturday 10th of March 2018: 9 a.m. to 5 p.m.
Avalon Quilters 2018 raffle quilt (Queen size), “Touching Stars” is a 1930’s Vintage Quilt, made from material purchased in the U.S. and hand quilting done by members using traditional quilting patterns and YLI thread. Tickets for the 2018 Raffle Quilt ($2 each or 3 for $5) may be bought at Avalon Fabrics and Craft (4/24 Avalon Parade, Avalon Beach) or Cottage Quilts (Building 4, Quattro Corporate, 4 Daydream Street, Warriewood ) or at Patchwork on Pittwater (1 Mona Vale Rd, Mona Vale) – or from Avalon Quilters (Thursday in Avalon Uniting Church) or at the 2018 Exhibition of Members Work. "Touching Stars" seems to have sparked a theme in the quilters 2018 works as many of the quilts will have lots of tiny stars. Funds raised from the 2018 Raffle Quilt will again be put towards the wonderful work being done by the Australian Mitochondrial Disease Foundation. The AMDF was founded as a not for profit organisation in 2009 by Doug and Margie Lingard, their friends, and experts in the field of mitochondrial disease (mito). Doug and Margie tragically lost their son Alex to mito, and their daughter, Rose, passed away from mito in June 2017 after a 10 year battle against the disease, aged just 29. 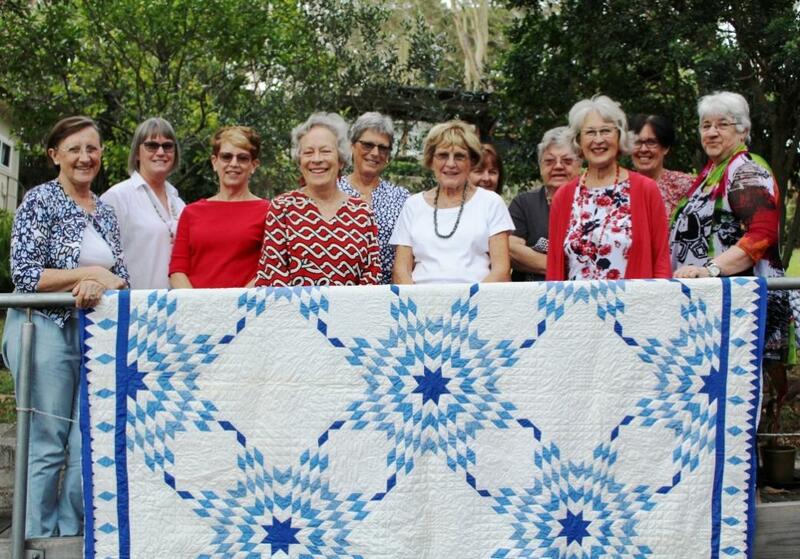 Pittwater Online spoke to the Avalon Quilters about some of the wonderful works you will see this year – all done by members, some Traditional and Modern takes on Quilts and Quilting. This also forms what will be the 2019 Raffle Quilt from the 1800’s – with some reproduced 1860’s fabrics. These were sourced from Dr. Annette Gero, one of Australia's and the world’s leading quilt historians who generously sold some to the Avalon Quilters. More on Dr. Gero's most recent War and Pieced Exhibition, in New York, below. The 2019 Raffle Quilt from the 1800’s – with some reproduced 1860’s fabrics - a work in progress. This wonderful Quilt is one the Avalon Quilters call the ‘Op-Shop Shirt Quilt’. Members all had to form quilting blocks from shirts they found from Op-Shops or old shirts they had at home and all make blocks. The shirts are made of great fabrics and lend themselves to designing great block – this block, for instance had the lines in the pattern and was cut so they all came together thus. This one, which is being handmade by Trish is called "A Tribute to Susan McCord". Mrs. McCord was an ordinary Indiana farmwife with an extraordinary genius for quilt making. Her trailing vine quilt (1880-1890), featured in the collections of The Henry Ford is an original, showcasing her skill at manipulating fabric, color and design to turn her work into a masterpiece. Up to 12 pieces form the blocks Trish has made here. She's hoping to have it completed in time for visitors to the 2018 Exhibition of Members Work. There will be close to 100 Quilts on display this year, some will be for sale. "Members are happy to give guided tours to lend insight to visitors on the various displays " Anne Perry said. Two visitors will also be at this year’s Exhibition of Members Work, Carol Roberts of Cherry Pie Design. Carol is a Central Coast resident. Carol’s love affair with quilting began about 14 years ago. Prior to that she was doing needle work of most descriptions. Her passion is for making Olde world quilts, using antique quilts as inspiration as well as antique quilting designs. “Inspiration can be found in most places if we look hard enough…anything from nature, fabric images, architectural shapes or just colour. So keep your eyes open for that perfect inspirational item. The second Visitor this year is Pam Dwyer, also a Central Coast lady, who makes handbags from Antique Kimonos will also be at the Exhibition of Members Work and will have these handbags as well as kimonos for sale. Working under the name 'Twocats', designer is Pam Dwyer works are a serendipitous collision of materials combined with her innate sense of colour and form. Drawing on her extensive training and experience in Interior Design Pam combines vintage fabrics, silk, velvets, yarns, Japanese Kimono & Obi silks with vintage buttons and embellishments to make pieces of magical and highly desirable wearable art. All her work is handmade and one of a kind making it truly an original. Visit Twocats. There will also be a Craft Stall of Avalon Quilters gifts and handmade articles – always a bonus at each Exhibition of Members Work. The Avalon Quilters started off in 1984. For the last several years the Avalon Quilters have met on Thursdays to pursue their love of quilting in the Avalon Uniting Church hall. They have stitched hundreds of quilts during this time, some of which will be on display this March. The 2018 Avalon Quilters Exhibition of Members work will be a Quilters and Artists delight, and there is that beautiful 2018 Raffle Quilt! The Avalon Quilters annual Exhibitions of Members Work, with their annual Raffle Quilt and sale of handicrafts to support AMDF's work, is one of the annual Quilt Shows for many here. This year "Touching Stars" will have an especial meaning for many in the community while the works on display will be a tribute to handmade love - which is inherent in the hundreds of years such works have been created and threaded to make Wedding Quilts, Baby Quilts, Anniversary Quilts and blankets to keep warm and comfort when many are miles from home. Recently the Annette Gero Collection formed an Exhibition at New York and was one of the top 10 Quilt Exhibits in 2017. The exhibition closed on January 7th, 2018. Organized by the American Folk Art Museum, New York, in collaboration with the International Quilt Study Center & Museum, University of Lincoln–Nebraska. Co-curated by Dr. Annette Gero, international quilt historian, author, and collector, and Stacy C. Hollander, Deputy Director for Curatorial Affairs, Chief Curator, and Director of Exhibitions at the American Folk Art Museum. War and Pieced was the first exhibition in the United States to showcase the spectacularly complex geometric quilts made exclusively by men using richly dyed wools derived from British military and dress uniforms. Once termed “soldiers’ quilts” or “convalescent quilts,” the pieced textiles are most closely associated with the Crimean War as well as conflicts in India, South Africa, and other troubled regions of the British Empire during the nineteenth century. The exhibition further relates these military quilts to an earlier technique of pictorial inlaid or intarsia quilts, made with felted wools during the Prussian and Napoleonic wars beginning in the mid-eighteenth century. The visual virtuosity of the quilts, often incorporating many thousands of pieces no larger than one-inch square, assumes a deeper emotional resonance as we consider them within the matrix of war and its aftermath. The quilts are drawn primarily from the unparalleled collection of internationally acclaimed quilt authority Dr. Annette Gero, with additional examples from public and private collections, many never before on view. The 240-page publication Wartime Quilts: Appliqués and Geometric Masterpieces from Military Fabrics (The Beagle Press, 2015) accompanied the exhibition and was available through the American Folk Art Museum Shop beginning in September 2017. Beaded Soldier’s Quilt, artist unidentified, India, c. 1860–1870, wool, with beads; inlaid; hand-appliquéd and hand-applied beadwork, 63 x 63″, The Annette Gero Collection. Photo by Tim Connolly, Shoot Studios. Intarsia Quilt with Soldiers and Musicians, artist unidentified; initialed “J.S.J.,” Prussia, c. 1760–1780, wool, with embroidery thread; intarsia; hand-appliquéd and hand-embroidered, 55 x 43″, The Annette Gero Collection. Photo by Tim Connolly, Shoot Studios. Dr Annette Gero, one of Australia's leading quilt historians, has been documenting and collecting quilts since 1982. She has travelled all over Australia giving lectures, curating exhibitions of Australian quilts and documenting quilts in private homes and public collections. She gained her PhD in 1982. In 1986 she was elected a Fellow of the Royal Society for Arts (London) in recognition of her work on Australian quilt history. She is a member of the Advisory Board of the International Quilt Study Center, Nebraska, USA and an Associate Fellow; Founder and Patron of the Sydney Quilt Study Group; Past President of the Quilt Study Group of Australia; Lecturer, the Australian Academy of Decorative Arts, and her contribution to the history of Australian quilting has been documented in the Archives of the National Library of Australia. Canberra. She has lectured on quilt history in the USA, Canada, New Zealand, France and England, and exhibited quilts throughout Australia and at the Musee De L'impression Sur Etoffes, Mulhouse France; the Musee des Traditions et Arts, Normandy, France; the International Quilt Show in Houston, USA and the European Quilt Symposium, Alsace, France. Her first book “Historic Australian Quilts” is now out of print.